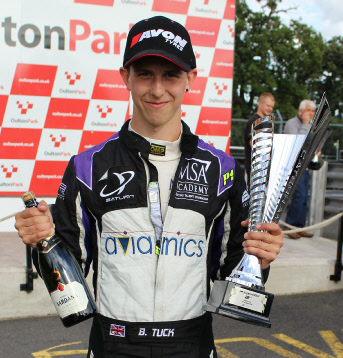 Ben Tuck wins maiden Caterham podium in Oulton Park thriller! 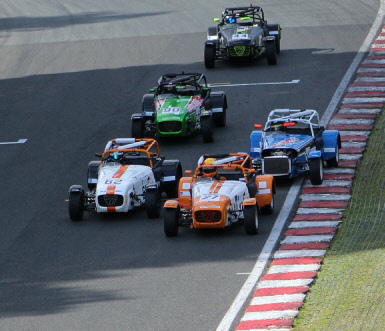 Under glorious summer skies, the picturesque parkland circuit of Oulton Park worked its magic once more for Young Driver of the Year, Ben Tuck this weekend as the Bedfordshire based driver claimed 2nd place and his maiden podium of the Caterham Supersport Championship. 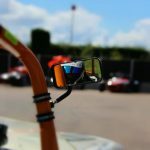 The Cheshire circuit hosted Ben’s first ever car race only 2 years ago and then his first ever win as he fought his way to 3rd in last year’s Mazda MX-5 Championship, the hardest fought season in its history. Given the provenance, Ben looked forward to this latest instalment of the Supersport Championship with high hopes after a difficult start to his Caterham campaign. Ben has joined what is perhaps the most subscribed, highest quality and closest fought season in the championships history, and since blasting straight in with a front row qualifying position in Round 1 at Brands Hatch, he’s faced engine all manner of collisions, mechanical problems and plain bad luck. Oulton Park changed that. Ben claimed 6th on the grid out of 31 after a strong qualifying session where his adversaries used their 3+ years of experience in Caterhams to time their laps to take advantage of the strong draft that the cars create. In Race 1, Ben was in the thick of a train of a dozen cars fighting for position. Exchanging positions on almost every corner made for a spectacular race, but after the fierce half hour battle, Ben maintained his position in 6th. Race 2 began in a similar fashion, but Ben kept with the leading pack as it gradually pulled away from the rest of the field. Sensing that the win was on, he began his assault, working his way to the leading pair within 3 laps. Then for lap after lap of side by side captivating racing Ben repeatedly swapped the lead and fought in a relentless and constantly changing battle. On the final lap he made his move to take the win with a stunning pass on the Championship leader around the outside of Old Hall corner. On the last corner of the last lap Ben was again challenged for the lead, and giving just enough room to stay fair, Ben raced for the line just missing out on the win by half a car length to claim his first Caterham podium in his 5th ever Caterham event. Elated with the result, Ben thanked his team: “We’ve all been waiting for this. It’s been on the cards since the start of the season, but it’s not happened for various reasons. The car was strong this weekend, everyone at PT has worked so hard for this result and my engineer and all the guys at PT Motorsports deserve it”. The result moves Ben into the top ten in the Championship standings with 2 events to go. Meanwhile, he continues to develop growing opportunities that could see him driving a GT car in 2017. Now with a result that matches his season long promise, the timing couldn’t be better. Ben next races at Croft on 10th and 11th of September.